﻿ Northern Ireland Ends Hare Coursing - Mr. Roy Beggs Jr. 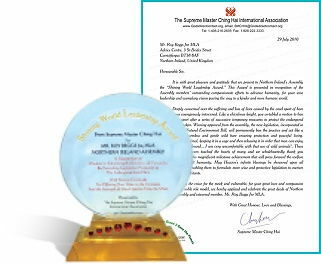 In Golden Year 7 (2010), on behalf of Northern Ireland, Mr. Roy Beggs Jr. was honored with a Shining World Leadership Award by Supreme Master Ching Hai for enforcing the banning of hare coursing in the country. The Irish hare used to be widespread and common throughout Ireland. However, due to relentless hunting, the population underwent a substantial decline from the 1980s and has experienced localized extinction. Since 2002, the Irish hare has been subject to a Species Action Plan (SAP) which endorsed it as one of the highest priority species for conservation action. Following a series of temporary bans to protect the endangered hare, members of the Northern Ireland Assembly in the United Kingdom, Roy Beggs Jr. and Tom Elliott, proposed a permanent ban on hare coursing. “Catching a wild animal, keeping it in a cage, and then releasing it in order that man can enjoy the chase of his greyhound . . . I am very uncomfortable with that use of wild animals.” Mr. Beggs Jr. said. After a seven-hour debate on June 22, 2010, the motion to outlaw the use of greyhounds to chase and to kill hares was passed by a narrow majority. 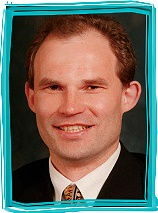 We applaud and celebrate the great deeds of Northern Ireland’s Assembly and esteemed member Mr. Roy Beggs Jr., MLA.